For those who lead an active and dynamic life, AIR OPTIX Night & Day Aqua is an excellent pick. Apopular offering from Ciba Vision, one of the mostrenowned manufacturers of eye care products, thesedaily contact lenses offer exemplary comfort for up to 30 nights continually. 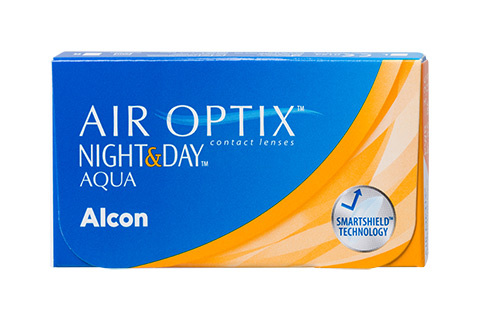 FDA-approved, AIR OPTIX Night & Day Aqua contact lenses can be worn even during sleep. Hence, this product is recommended by eye care professionals for those who travel a lot and lead a busy lifestyle. The most breathable, soft contact lenses of its kind, AIR OPTIX Night & Day Aqua allows six times more oxygen to your eyes. Plus, the advanced ultra-smooth surface technology provides retentionof moisture on the surface and resists unwanted deposits of debris, offering crystal clear vision throughout the lens wearing duration. At Mister Spex, you can talk to our qualified online opticians and find out the best contact lenses foryou, and buy them with professional guidance.